In our house, it’s no secret that we are BIG oatmeal lovers. Every morning for as long as I can remember, a warm bowl of oatmeal has been our go-to breakfast. When our baby first started on solids, I was so excited to be able to start giving him oatmeal that it was one of the first foods that we introduced to him. But lo and behold, that very first time we tried giving him oatmeal, he broke out in a rash and we could tell that he had an upset tummy. Of course, as a gigantic oatmeal lover, I was BUMMED. So we stuck to eggs, toast with peanut butter and fruit or mini 2-ingredient pancakes and pumpkin banana french toast sticks as our primary breakfast staples. We tried him on the oatmeal again at 9 months and he pretty much had the same reaction as the first time. It wasn’t looking’ good for the oatmeal. Then, just after his first birthday, I decided to try him on the oats again and THIS TIME, he had zero reaction and appeared to thoroughly enjoy his oatmeal. So in all of my excitement, I started whipping up ALLLLL of these different variations of oatmeal for him to try out at breakfast time. I figured that a baked oatmeal might go over better than a regular bowl of oats since he could feed it to himself and it would be less messy. Less mess is what I’m all about these days, especially since the latest form of entertainment seems to be whipping everything in sight onto the floor. 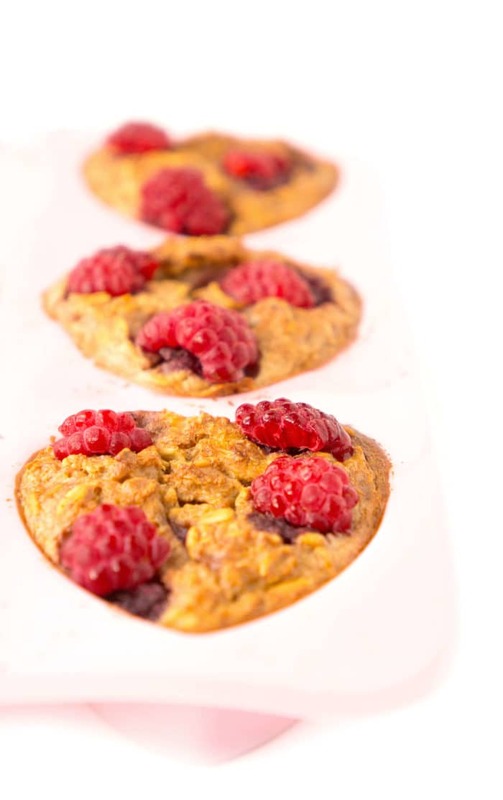 Both he and my husband are both raspberry and banana kings, so I decided to bake them some Raspberry Banana Baked Oatmeal Hearts. 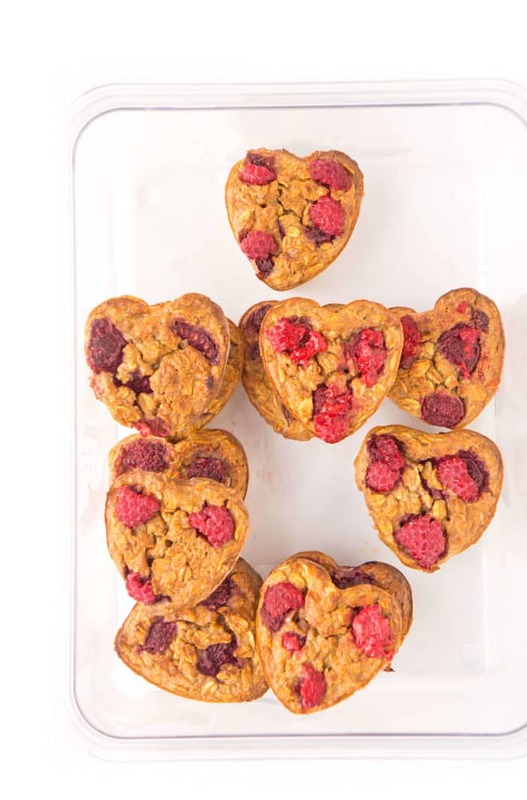 But in all fairness, I decided to transform the baked oatmeal into hearts for a number of reasons. Hear me out. Number one, I had a silicone heart shaped baking tray that I wanted to test out since I had never used before. As it turns out, it worked perfectly because I was able to easily pop out each individual heart with NO STICKING. Nothing is worse than losing half of your baked goods on the baking pan. Number two, Valentine’s Day is just around the corner so I wanted to inject a little extra love into the raspberry banana baked oatmeal. 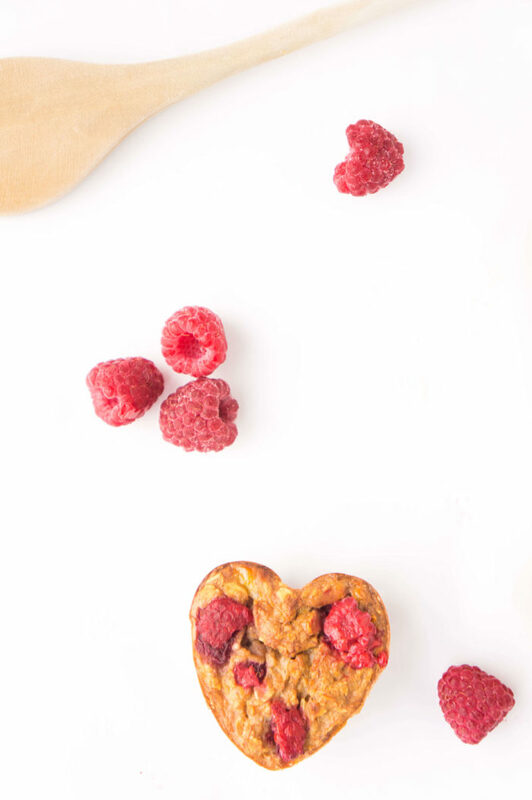 Number three, eating heart shaped raspberry banana baked oatmeal is so much more fun that eating just a regular piece of baked oatmeal. Am I right, or am I right? 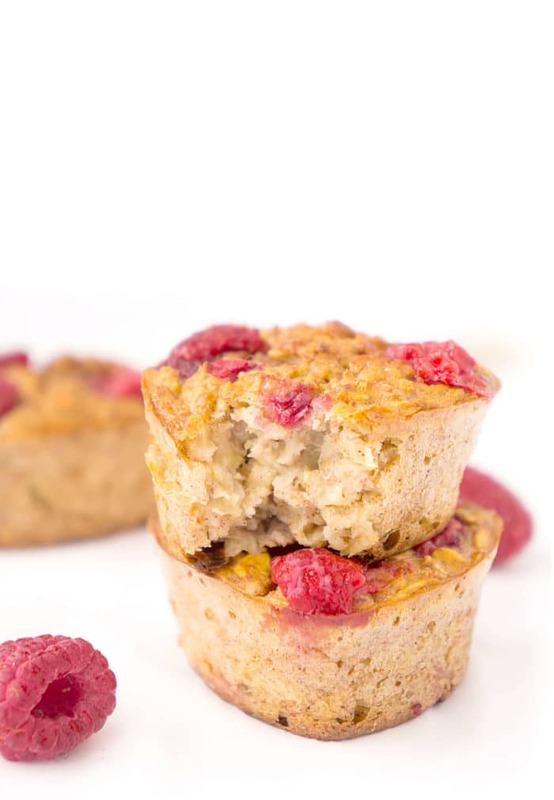 They are perfectly portioned so you can basically grab a couple of them in the morning for a quick and easy breakfast or snack. They are freezer-friendly. 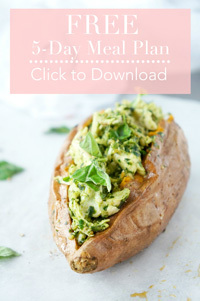 Just pack them into a container (use parchment paper to separate if stacking) or place them in a ziplock bag. Just grab and go! There is absolutely NO ADDED SUGAR. Keep in mind that they’re not overly sweet since they’re only sweetened with the banana and raspberries so you may wish to top them with some extra fruit or a little drizzle of maple syrup. I like to have mine topped with a little bit of natural peanut butter or almond butter and I do the same for baby at breakfast time to sneak in some extra healthy fats. 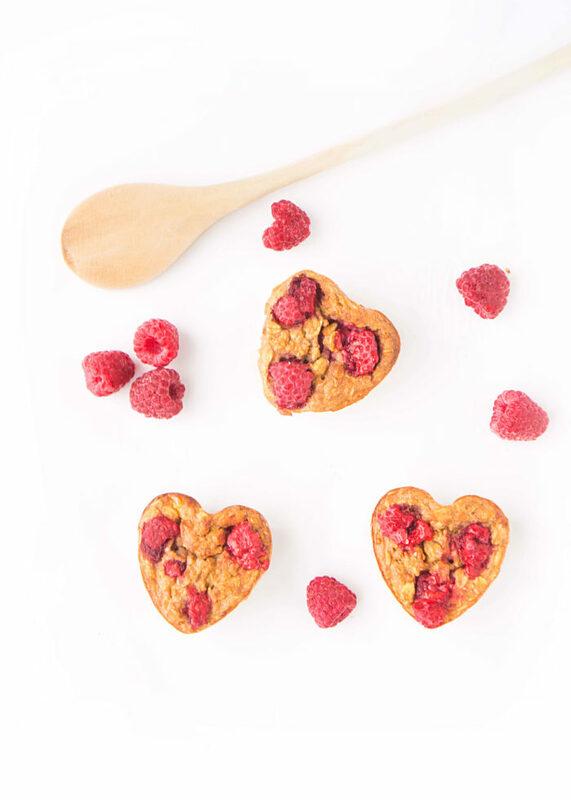 These baked raspberry banana oatmeal hearts are also a good source of fibre and protein, so they’ll keep you feeling full for hours! 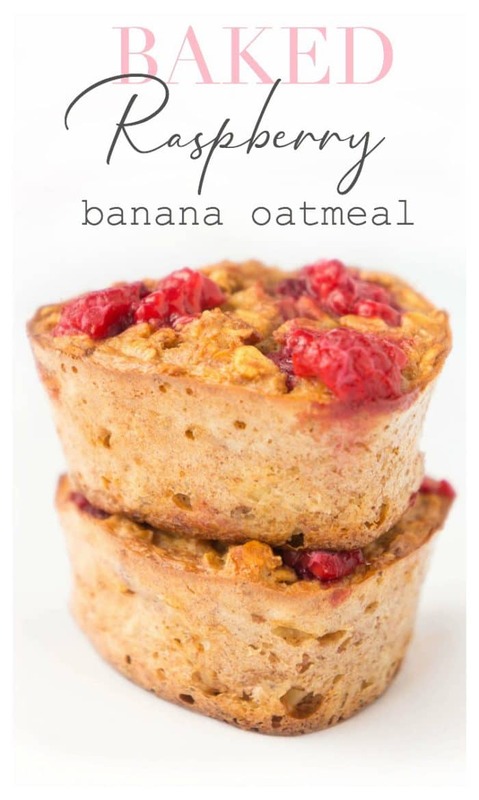 You can serve this baked oatmeal warm or cold. I like to warm the baked oatmeal up a bit since I’m always looking for the extra warmth, especially in these chilly winter months! Plus, they’re super cute for Valentine’s Day, which is just around the corner! In a large bow, mix all of the dry ingredients together. In a medium bowl, mix all of the wet ingredients together, other than the raspberries. Add the wet ingredients to the dry and mix until incorporated. Evenly distribute among 36 silicone heart shaped cups or regular cups. 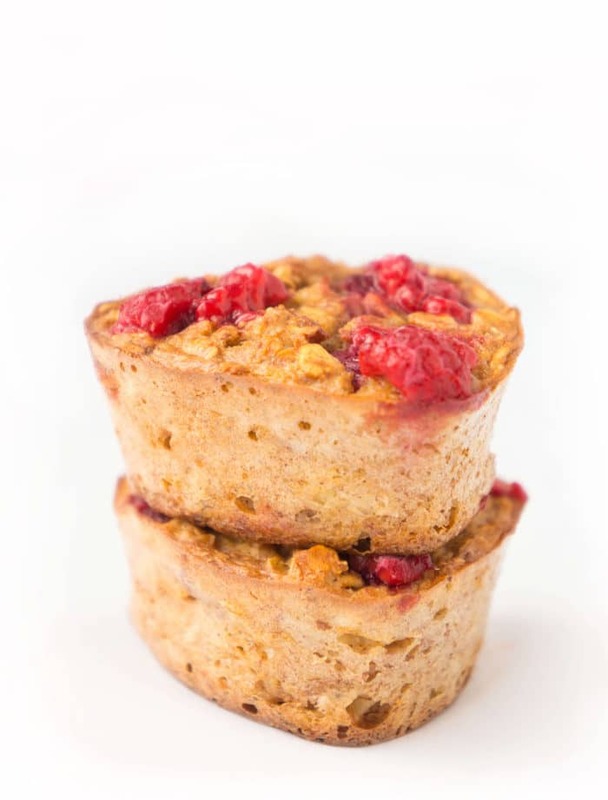 Top the cups evenly with the raspberries pressing gently so that they sink into the oatmeal mixture.